Besøg Mtskheta, en af ældste byer i Georgien, på en halvdags tur. 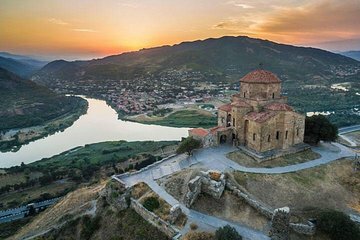 De historiske monumenter i Mtskheta er udpeget som UNESCO World Heritage Site, og på denne tur lærer du mere om, hvordan byen fungerede som Georgiens hovedstad i hundreder af år. Gamlebyen Mtskheta er et sted af stor arkæologisk betydning i dag og er fortsat det moderne hovedkvarter for den georgiske ortodokse og apostolske kirke. The tour was more like 5 hours, we visited Mtskheta on the hill, then went down to the village to visit the chapel there. We were not able to go in the church because they were having a service, this is what the tour company needs to be mindful of. This trip was supposed to take approximately three hours, but it took five. Not because of traffic, but because the trip wasn't very well organized. We visited three churches and one wine shop. The best thing about the trip was the view from the Jvari Monastery. Everything else seemed like a waste of time, specially the stop at the wine shop. If it was a winery it would have made sense, but it was a pretty standard shop, similar to those you'll find in Tbilisi.